Below is a slideshow of aerial photographs of Outdoor Wood Boilers taken by G. Leslie Sweetnam on 2-7-09 just south of Danielson,CT. It really illustrates that you do not want to be downwind in the plume of one of these suckers. 2008 Outdoor Wood Boiler Brochure This brochure contains OWB facts and figures. News: New York Times:Wood Boilers Cut Heating Bills. The Rub? Secondhand Smoke. March 12, 2007 The Republican: Chicopee Follow Up. Communities weigh boiler rules. See bottom of this page. From Washington State EPA: Are OWB's Worse Than Indoor Woodstoves? Yes. Newly manufactured indoor woodstoves are required to meet strict Washington State particle emissions standards, 2.5 grams per hour for catalytic stoves and 4.5 g/hr for non catalytic stoves. Certification tests are conducted in EPA approved laboratories. In contrast, tests done by the Northeast States for Coordinated Air Use Management (NESCAUM) found that the average fine particle emissions (a particularly harmful pollutant) from one OWB are equivalent to the emissions from 22 EPA certified wood stoves, 205 oil furnaces, or as many as 8,000 natural gas furnaces. One OWB can emit as much fine particle matter as four heavy duty diesel trucks on a grams per hour basis. The smallest OWB has the potential to emit almost one and one-half tons of particulate matter every year. Although older style indoor wood stoves emit more than new certified stoves, they are still several times less polluting than OWB's Due to the poor combustion conditions, it is also probable that OWB's emit proportionately more benzene, polycyclic aromatic hydrocarbons, formaldehyde and other toxic partial combustion products which have been linked to asthma, heart attacks and cancer. What the wood heat industry has to say for itself, July, 2006: "Outdoor boilers smoke so much that many local jurisdictions have banned them." "I must say I am appalled at the lack of progress in outdoor wood furnace design. Most of the manufacturers have not improved their design at all!" The Wood Heat Organization: Answers to your questions about burning wood for heat and enjoyment. User report: "It goes though wood in a hurry, a big hurry! It went through in a week what I thought would last for three weeks to a month." Improving Kids' Environment- (PDF- 43K)a letter from an Indianapolis nonprofit urging regulation of OWB. read this article, then marvel at the AmaZiNg, sTuNnInG, iNcOnSiDeRaTE nature of the human animal." Washington township supervisors asked to ban wood-burning heaters. WASHINGTON TWP. | Marilyn Sheridan worried over a nearby fire when she woke up last spring and found her home full of smoke. But when township firefighters arrived, they told her there was nothing they could do about it. The smoke came from a neighbor's outdoor wood-fired boiler, they said. And nobody regulates those. "The only defense is to go inside and close the windows," Sheridan said. "We want to breathe." Fed up with wood-fired boilers blowing smoke through her Chris Court neighborhood, Sheridan urged township supervisors Wednesday to ban or regulate a water-heating source rising in popularity as oil prices skyrocket. Supervisors said they would examine the issue. But, as of now, like Sheridan and the fire department, they say there is little they can do. Unlike indoor wood stoves, there are no state or federal regulations for the outdoor boilers, which puff out billows of smoke that can hover near ground level and roll through neighborhoods. An outdoor wood-fired boiler is a small shed with a 6 to 10 foot chimney. Inside is a firebox that heats water, which is piped to a home. But the fireboxes burn at low efficiency, as low as 50 percent, according to an Environmental Protection Agency study. That creates more smoke than higher-efficiency burns. Wood smoke contains soot that can become lodged in lungs, leading to short-term or chronic cardiovascular problems, according to the Department of Environmental Protection. "It's well documented that secondhand smoke is hazardous," said Quin Teel of 98 Chris Court, a nurse and one of 54 township residents to sign a petition circulated by Sheridan in opposition to the boilers. "If you're on the wrong side of a campfire, no one needs to tell you to move," Sheridan told the supervisors before handing them a sample ordinance against the boilers drafted by the state Department of Environmental Protection. Supervisors Chairman David Hess said he would like supervisors to pass a similar ordinance but worried it would not address boilers already in the township. Solicitor David Ceraul said the township could either ban or regulate the boilers. But existing boilers might be grandfathered and the township might not have the resources to regulate their use. "We need to take a step back, digest the information and maybe get together some research," Supervisor David Renaldo said. In the meantime, the boilers have become an increasingly popular way to save on home heating costs. What is in the air you are breathing? The Federal Government has deemed that residential outdoor wood burning furnaces are one of the largest sources of toxic emissions to the atmosphere of North America. Studies prove that short term exposure to the smoke causes eye and throat irritation, cough and shortness of breath, while chronic exposure triggers asthma attacks, heart and lung disease and cancer. The basic design of the furnace is one of incomplete combustion, causing fuel (usually wood) to burn incompletely, smoke excessively when thermostats call for air, then to smolder until the cycle begins again and again. The smoke is thick, acrid, and high in toxic waste emissions. This is why you often see a "smoky haze" in the area of outdoor furnaces. The tiny toxic particles in the smoke pass by the body's natural filtering system and lodge deep in your lungs. One outdoor furnace pollutes more per hour than two heavy duty diesel trucks, more than forty passenger cars, more than one thousand oil furnaces, and more than eighteen hundred gas furnaces. Many states have banned or regulated the furnaces. Some regulations include the following: furnaces must be installed 200 to 500 feet from the nearest residence; furnace stack or chimney must be higher than the roof line of the neighbors home if the furnace is between 200 and 500 feet from that home; furnace can only operate six minutes out of each hour; furnace permits can be suspended if odor contaminants are detectable outside the property on which land the furnace is located; and dealers must provide buyers with notice that only untreated, natural wood can be burned in the furnace. The furnaces are being operated in West Virginia with little to no environmental, safety or performance standards. There IS a West Virginia code stating that "It is unlawful for any person to cause a statutory air pollution" and a "public policy" to achieve and maintain such levels of air quality as will protect human health and safety to the greatest degree practiceable, foster comfort and convenience for all people, etc." New York DEC and other state codes declare no person shall cause or allow emissions of air contaminants injurious to humans or property, of which unreasonably interfere with the enjoyment of life or property. I believe it is a reasonable expectations of our politicians to responsibly recognize and protect the very quality of life where we live. Owners of the furnace consider them to be an ideal, less expensive way to heat homes and water. How do homeowners measure the cost of their health problems resulting from the toxic smoke they are forced to breathe from a neighbor's furnace? Facts determine that approximately 155,000 units have been sold nationally since 1990. It is estimated that as many as 500,000 furnaces will be operating by 2010. West Virginia is one of the 19 states purchasing 65 percent of the furnaces. The lives of many loved ones lost years ago have been attributed to pollution in coal mines, railroads, etc. Some died because they did now know the dangers; others died because they had no choice - they had to work in harms way to support their families. Industries have since invested millions to comply with environmental standards to protect and improve working conditions for employees. Would it not be equally important for us to invest attention in protecting our personal health and well being? We now know the serious and real toxic hazards resulting from the outdoor wood burning furnaces and we now have a choice to do something about it. I am asking you and our politicians on every level to place priority on the environment, the health of our children and each other, and to follow the lead of other concerned states and ban the outdoor wood burning furnace. News:© 2006 The Evansville Courier Co.
Evansville City Council The Issue: Council bans new outdoor wood-burning boilers. The Evansville City Council gave a break Monday to city residents who own outdoor wood-fired boilers used for heating their homes, but it decided that no new installations would be allowed within the city limits. This appears part of a widespread effort to quash the use of these low-cost but high-polluting devices. The Indianapolis Air Board has already passed a ban on new installations, and the Indiana Department of Environmental Management has been collecting information and opinions on outdoor wood boilers in terms of possibly adopting a state rule on their use. While there are relatively few of these boilers in use in Evansville and in Indianapolis, they have come under fire for the large amount of smoke they put out, smoke that lays low to the ground and can easily reach a neighbor's home, especially in an urban setting. The council attempted to deal with that problem by requiring the installation of high stacks, up where the smoke would more easily disperse. But after an owner of one of these boilers complained that the cost of a 40-foot stack would put him out of business and would be dangerous, the council dropped the requirement. Anyway, this issue seems to affect very few people in Evansville and has likely already been forgotten by most. But we were wondering, smoke is smoke, isn't it? And it contains some nasty stuff, including particulate matter, which is the latest bane to good air quality in the Evansville area. Might the issue one day not be these little-used boilers but instead be fireplaces and wood stoves? Might this movement against wood-burning boilers be an omen of things to come for those of us who enjoy that warm and fuzzy symbol of winter coziness, the fireplace? We've found no figures on the effects on the air of wood stoves and fireplaces, compared with these boilers, but Dona Bergman, director of the Environmental Protection Agency, says that the boilers have low efficiency, 30 percent to 40 percent, and that the particulate pollution from one of them is equal to an incredible 1,800 gas furnaces. Still, a lot of us have fireplaces or wood stoves. There is no telling how much particulate matter all of us together send out our chimneys on a winter morning. It's unlikely any local politician is going to take on that number of fireplace-loving voters, but be warned, it is coming, one of these days.How do we know? It has already started on the West Coast, where groups in some communities are pointing to the pollution caused by wood-burning fireplaces. Their message: Don't burn wood. And you know what they say about the West Coast: Everything that happens here happens first on the West Coast. © 2006 The Evansville Courier Co.
As people look for alternative and less expensive ways to heat their homes, one resident wants to make sure they are not risking the health of others. Bob McDonald, who lives on Aaron Road, wants the Board of Health to regulate outside wood boilers in Sudbury. There are believed to be three outside wood boilers in town. "They are unsafe and I would like to see them regulated so they are not in residential neighborhoods," he said. McDonald met with the Board of Health last week to share his concerns and the research he had completed. "He presented us with a lot of data to consider. We are reviewing the data and the matter, as well as independently researching it ourselves," said Lynn Geitz, a Board of Health member. She said the board is always happy to review concerns brought before them. Outdoor wood boilers are typically located outside the buildings they heat, often in small, insulated sheds with small smokestacks. Wood is burned in them to heat water, which then in turn provides heat and hot water to a home. They should not be confused with chimneys or stoves regulated by the Environmental Protection Agency. The smoke created by the wood boilers, or more specifically the particulate pollution, is what McDonald is concerned about. "Some of the things that are caused by these wood boilers are respiratory illnesses such as chronic bronchitis, obstructed lung disease, increased risk of cancer, genetic mutations and cardiovascular disease," he said. "That's in addition to eye irritation, throat and lung irritation that can cause headaches and it can reduce lung function in children." The fine particles become embedded in the lungs and never go away, he said. Research McDonald has done also shows that this pollution can travel 1.5 miles. "Even though you're not smelling the smoke you could be breathing in the particles," he said. According to the Massachusetts Department of Environmental Protection, an outdoor wood boiler emits as much fine particle pollution as 2 heavy-duty diesel trucks or 45 cars. Wood smoke from these boilers is 12 times more dangerous than cigarette smoke, McDonald said. "The American Lung Association has come out and said these are very bad. There's just overwhelming evidence that these are a health concern and people need to be aware of this," he said. Although information was presented to the Board of Health, members will collect their own data and research to supplement what McDonald submitted. "The information presented has not been discounted at all, but it is not without some weaknesses," Geitz said. "He has done a very thorough job." The board is expected to discuss the issue of wood boilers again after its research is completed, she said. Geitz does not believe the town has ever received a complaint about a specific wood boiler in Sudbury. McDonald said he presented his finding to the Board of Health to make both them and residents aware that this is a major health problem. "People should be active and start demanding that the Board of Health stand up. I'm sure that they will, but it would be helpful if other people stepped up and said, 'We don't think it's right that we all should be impacted,'" he said. McDonald questions whether one person who wants to save money on their heating bill has the right to impact the health of thousands of other people. There is ample research out there to prove that the smoke from outside wood boilers is not good for people to be breathing in, he said. The state of Washington has established regulations that essentially ban these boilers and in Maryland there is a $25,000 fine for using them. Tisbury, which is on Martha's Vineyard, now requires a 900-foot buffer zone around these wood boilers. "You have boards of health from one side of the United States to the other...and everybody in between who have sounded the alert," he said. The Board of Health has banned residents from operating outdoor wood burning boilers, hoping to fend off a possible public nuisance. The regulations go into effect Oct. 1, and effect all boilers except the three already in town. Those grand fathered in - one on Fisher Street, Robin Lane and Mount Pleasant Street - are able to remain in use as long as they don't become a nuisance and follow the stated regulations, the board ruled last Tuesday. The ruling comes as a preemptive strike against the dirty boilers, McNulty explained. After attending a Department of Environmental Protection presentation on the heating devices and witnessing firsthand the mass amounts of smoke they emit in upper-state New York, McNulty didn't want more boilers coming to town. "You can't believe the amount of smoke coming out of them. One time (in New York) I thought a house was on fire because of the smoldering smoke," McNulty said. "They're completely unregulated and there are no standards for emissions." A permit is required to operate an existing wood boiler after Oct. 1. Only untreated wood fuel may be burned in the unit. The outdoor burners are a wood fired boiler surrounded by a water jacket in a structure like a small shed with a short smokestack on top. The boiler heats water that is carried by piping to provide heat or hot water to a building. Their costs range from $8,000 to $10,000. The Board of Health held two public hearings on the subject, one in August and another last week. A second hearing was held because the first one wasn't advertised correctly. At the first meeting the board ruled on the new regulations, but had to bump back the dates a month to correct for the error. The regulations would have gone into effect Sept. 1. At the meeting last month two individuals attended, the owner of the boiler on Mount Pleasant Street and a neighbor of the one on Fisher Street. The neighbor expressed concerns over health effects caused by the smoke from the boiler. No residents attended last week's meeting. "The DEP has been receiving a number of complaints about them across the state. They can emit tremendous amounts of smoke and can be used all summer long to heat hot water in the house or swimming pool," McNulty said. Because of increasing heating costs, the boilers are cheap to run if the owner has access to free wood. McNulty was concerned more would be built in town. 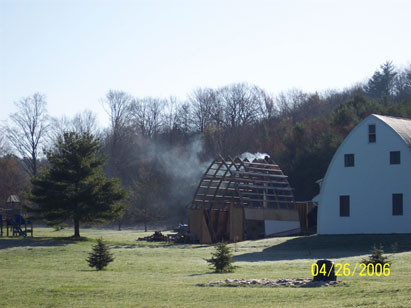 The MassDEP estimates that 1,140 outdoor wood fired boilers were sold in the state through 2005. EAST MILLINOCKET - The Board of Selectmen will attend Millinocket's Town Council meeting Thursday because selectmen are considering enacting their own ban of outdoor wood-fired boilers and want to see how the council addresses the issue. The selectmen, board Chairman Mark Scally said Monday, will watch how the issue is addressed by a representative from Clean Woods Heat LLC, a startup manufacturer that plans to sell its 90,000-BTU Black Bear outdoor wood-fired boiler at its Katahdin Regional Industrial Park offices starting Sept. 1. "At this point, there is only one [polluting outdoor boiler] in town, so we had to wonder whether we were cutting them off at the pass, or are we just creating an ordinance that isn't going to be enforced," Scally said Monday. Millinocket Councilor Scott Gonya proposed the ban, saying several Penobscot Avenue residents live near a resident whose home-heating boiler emits so much smoke that a smoky odor has infiltrated their homes. Penobscot Avenue residents have complained about the boiler since 2000 or 2001, Gonya said, but it wasn't until the American Lung Association opposed such boilers in June that he sought a ban, he said. New Jersey, Massachusetts and New York municipalities have banned such boilers. Jeffrey W. Baker, co-owner of Clean Woods, agrees that such boilers usually are polluters, but his is not. Most outdoor boilers, Baker said, produce 100 to 400 grams of particulate waste an hour. By comparison, most wood stoves today produce about 7.5 grams. His Black Bear boiler produces, at worst, about 20.3 grams of particulate waste per hour, a substantial improvement over most boilers, he said. Baker's business partner, boiler inventor Dominic Federico, said they will attend Thursday's meeting, which is at Millinocket's town hall at 4:30 p.m.
Millinocket Town Manager Eugene Conlogue indicated he would try to alter the proposed ban to exclude banning boilers that meet voluntary proposed federal Environmental Protection Agency standards, Federico said. This, Federico said, would ban polluting boilers while allowing use of Black Bear and other clean burners. Maine Department of Environmental Protection officials already have tentatively endorsed the Black Bear and are expected to fully endorse it when burn tests conducted this week at an Oregon laboratory are finished, Federico said. Clean Woods, which employs a dozen people, is ramping up its assembly line this week. It will have 25 full-timers by early September and 40 workers on its payroll by January, company officials have said. This stirs hope in the rural Katahdin region, which typically has unemployment twice the state average. "This could be a banner business for the town," Scally said. The Black Bear will be featured in a segment in Channel 5's program "Save My Heating Bill" next month, and a commercial on the boiler is on the company's Web site, blackbearboilers.com, Federico said. PALMER - The Board of Health will continue its discussion about outdoor wood boilers at its meeting tomorrow at the Town Building on Main Street. At its meeting last month, the board instituted a temporary moratorium on outdoor wood-burning boilers. Tomorrow at 7 p.m., the board is expected to schedule a public hearing to discuss proposed regulations or a ban for the structures. "I'm sure we're going to have a big turnout. It's been a concern to me for quite some time," said Health Board member John J. Lukaskiewicz, adding the board has received complaints about units in residential neighborhoods. James P. Rooney, a Palmer lawyer who has expressed concern about a boiler on Calkins Road, wants the board to ban the boilers and order all existing units be dismantled. "One has no choice but to breathe the outside air in her or his neighborhood and community. There is ample evidence that the particulates and contaminants from the use of outdoor wood-burning boilers add significantly to the pollution of the air. We all need heat and hot water, but there is no right to choose a system which puts the health of others at risk," Rooney wrote in a Feb. 28 letter to the board. "The smoke knows no property lines or legal boundaries. There is no staff available to inspect the quality of wood or other material being burned ... The only reasonable regulation is a ban on the use of the boilers," Rooney continued. Rooney said he asked Curt M. Freedman of Longmeadow, an adjunct professor of alternative energy and energy management at Western New England College, to attend the hearing. Freedman gave a recent presentation in South Hadley, stating that one outdoor wood-burning boiler emits as much fine particulate matter as 12 wood-burning stoves. South Hadley has banned the boilers, as have Chicopee and Longmeadow. Belchertown, Southwick and Westfield have issued moratoriums on boilers. The boilers, that some say resemble a large dog house or tool shed, heat water that is pumped into the house. At the hearing last month, a Flynt Street resident told the board she is saving a lot of money with her $10,000 boiler. According to the Web site for Minnesota-based Central Boiler, the furnaces "provide a cost-effective, safe and environmentally responsible heating option that decreases the country's dependence on fossil fuels and foreign oil." Jeffrey Begley of Calkins Road uses one wood boiler to heat his home and a house next door. Begley said no neighbors have complained to him about the boiler. With seven children, he said the boiler has saved him a lot of money. Altogether, he owns 14 acres. "It's not like we're in downtown Chicopee," Begley said. There are also wood boilers on Mason, Smith and Elizabeth streets, Stimson and Peterson Roads and Country Lane. © 2007 MassLive.com All Rights Reserved. CHICOPEE , MA- The Board of Aldermen voted unanimously last night to ask the Board of Health to ban outdoor wood fired boilers in response to recent complaints by some residents about smoke and pollution. During a meeting at the City Hall Annex, Alderman-at-Large James K. Tillotson asked for two votes - one supporting the ban proposed by the Ordinance Committee and the other referring the matter for action by the Board of Health. Both were aoorived 12-0. Tillotson said he conferred with the aldermen's legal counsel, Daniel Garvey, about the best way to implement the ban, and they agreed it should go through the Board of Health. "I think the Health Department has much clearer authority when it comes to health issues," Tillotson said. Board of Health Chairman Frank Boron, reached for comment after the meeting, said his board will ask the Law Department to draft the proposed ban, and will then hold public hearings before making a decision. In the meantime, the Board of Health voted this week to extend its temporary moratorium on outdoor boilers until June 2007. Aldermen said last night that it was clear from testimony, both last night and at a prior meeting of the Ordinance Committee, that outdoor boilers create a concern about public health and pose a nuisance to neighbors. The proposed ban is aimed at both new and existing boilers. City officials know of four outdoor boilers in Chicopee. Two owners have defended their boilers, including one homeowner who received a building permit in advance and spent more than $10,000 for the boiler. Several neighbors and nearby residents said the boilers are a health hazard due to the wood smoke that is emitted. They praised the aldermen for taking up the issue. Joseph T. and Arelia G. Tumidajewicz of 340 Pendleton Drive, who live next to a house heated by an outdoor wood boiler, said they were very pleased by last night's vote. "I think a lot of communities will follow Chicopee's lead," Arelia Tumidajewicz said. Others speaking in favor of the ban last night included Janet Sinclair of Buckland, and Curt Freedman, P.E., a professor at Western New England College, who teaches energy management. What is happening in Chicopee is a warning to other western Massachusetts communities as the heating season approaches. Some Chicopee residents have installed a technology that was certainly new to me when I first heard of it: Outdoor Wood Boilers or OWBs. OWBs are simply a wood-fired furnace situated in a shed outside a residence or building. They produce hot water, which then can be used to heat a building. They are being sold as a way to either supplement whatever heating system you already have or to replace it. In these times of uncertain oil and natural gas prices, the idea of having a hedge is attractive to many. Across the northeast and the northern section of the mid-west, OWBs are growing in popularity, according to Saadi Motamedi of the Massachusetts Department of Environmental Protection. In 1990 there were 195 sold in this country. In 2005, there were 67,546 units sold. The cost to purchase and install a unit is between $8,000 and $10,000 depending upon size and application. Here's the rub, there are currently no federal standards governing efficiency or emission on OWBs, unlike indoor wood stoves, and only a hand-full of state or local regulations, Motamedi explained at a recent Chicopee aldermanic meeting. So people can install these boilers wherever they choose unless restricted by a local regulation. The result is one neighbor having a device that can affect the air quality of his street. The OWBs were not designed for urban areas, but they're popping up in densely populated cities. There are four in Chicopee. This is one of these terrible situations in which no one is wrong, but someone is going to have to pay a price. The neighbors shouldn't have to endure bad air quality. The problem is that one of these OWBs was installed only after the resident went to the city to obtain a permit for it. After a two-month period, the city's Building Department issued a permit. The trouble is that legally the city has currently no jurisdiction over the OWBs. If the city bans the OWBs a distinct possibility the residents will lose the thousands of dollars they've invested. They will be punished even though they didn't break any regulation. But their neighbors shouldn't pay a price either in a lessened quality of life. In all seriousness, where's Solomon when you need him? This is an example of a new technology out-racing a community's ability to deal with it. Other communities should take notice now before this same problem spreads. WASHINGTON TWP. | The state Department of Environmental Protection declined the supervisors' invitation to discuss outdoor wood-fired boilers, and the township is no closer to regulating the increasingly popular heating alternative, Secretary Lori Dobson said. Supervisors invited representatives from the department's air quality division to Wednesday's supervisors meeting. The board is considering regulations for the smoke-emitting heaters. But the department told the township it would not attend because it does not regulate residences, Dobson said. "It would just open (the department) up to too many other issues. People would want them to regulate everything and they don't have the manpower," Dobson said of the department's no show. Supervisors took no action on an ordinance that was tabled in December. They want a compromise between boiler owners and their opponents, Dobson said. Marilyn Sheridan and several Cris Court neighbors have lobbied supervisors since October to regulate the boilers, which they say have sent smoke rolling through the township and into their homes. The neighbors claim smoke from the boilers poses short-term and chronic health risks. The boilers are small sheds with 6- to 10-foot chimneys. Inside is a firebox that heats water, which is piped to a home. The boilers have gained popularity in the northeast as oil prices rise. There are at least 11 in the township, Sheridan said. Supervisors have considered regulations that would limit use of the boilers to fall and winter, set minimum heights for chimneys, require permits for ownership and establish setback requirements for installation. "I think we have convinced the board (of supervisors) this is a real problem and a real issue," Sheridan said. Reporter Douglas B. Brill can be reached at 610-759-0508 or by e-mail at dbrill@express-times.com.